So if it’s early January and you’re looking at this picture, it means it’s the trip to Kauai for AgroLiquid Retail Partners and employees. Anyone can go. Well if you’re a Retail Partner, you just have to sell a level of fertilizer. And if you are fortunate enough to work for AgroLiquid, just bide your time and your year will come up. Here is a view from the Kauai Beach Resort (KBR) looking towards the ocean. Beautiful place. After the long journey on Thursday, there is a group breakfast on Friday to welcome all to the island and cover what will happen during the week. There is a big group this year. Good. That means a good year of selling AgroLiquid. Wouldn’t you know it, that my time finally came around to be the breakfast emcee. It was great! And a chance to wear my favorite pineapple shirt. There are several company events at the resort, plus group tours of some of AgroLiquid’s business involvement on the island. But the real agenda is for everyone to relax and have fun, as reward for all of the hard work the previous year. And the work that lies ahead in 2018. 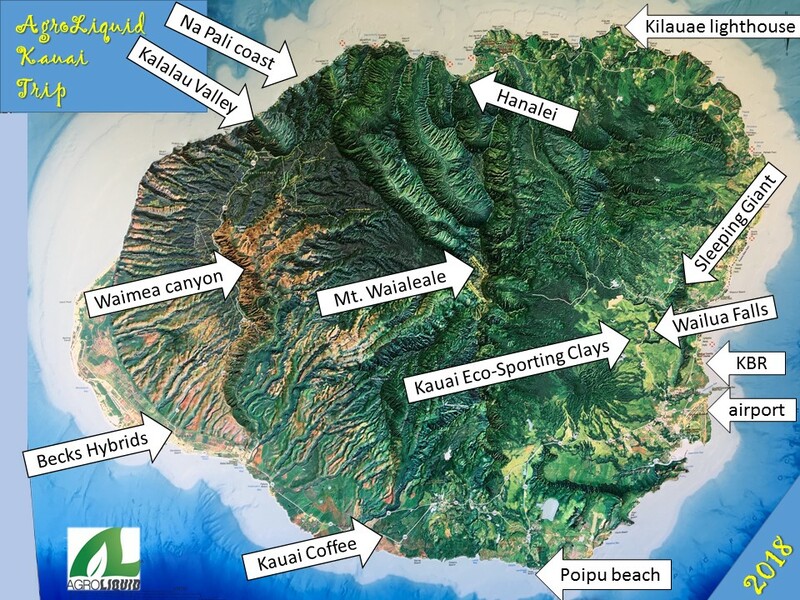 Here is a map of Kauai. The arrows point to some of the cool locations that we visited, and will be covered in the next several blogs. Again, the place we stayed is the Kauai Beach Resort (KBR) and this marks the 25th anniversary of AgroLiquid bring a group to that location. Hey, I was there then. One night was the company banquet. Our CEO Troy addresses the group giving history and encouragement going forward. And it’s because of the continuation of this company trip that enables us to be there. So thanks Troy! Regional Sales Manager Brian recognized the top sales efforts by giving background on the Platinum and Ring Retail Partners. It was inspiration for all. We have had a variety of banquet entertainment over the years. This year we had a local musician and story-teller named Makepa. He sang traditional Hawaiian songs and told stories from growing up on the island of Kauai. Like when he met Elvis at a boy during filming of Blue Hawaii at the Coco Palms hotel, which was near his family home. When you shook his hand, it was the same hand that shook hands with Elvis. I enjoyed the show here in the beautiful KBR ball room. Here is a view looking back towards the resort buildings at sunrise. It rained some, but here was the reward for that. Beautiful. OK, my wife Cathy gave me this pic. The weather overall was beautiful. If you weren’t wearing shorts and sandals, then something was wrong. Or you were on some official business. Hey, we do sell a fair amount of fertilizer on the island. More about that coming up. Aloha.